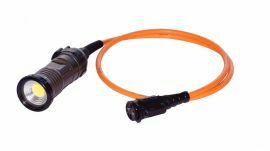 The Metalsub cable lights are developed through long experience within the diving community and they are manufactured using the latest advanced technology. The low weight metal housing with a chemical hardened surface layer makes the torches useable for sport and technical divers under any circumstances. 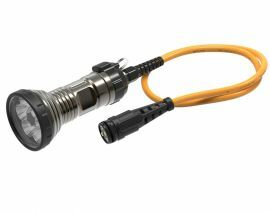 The diving light has a separate battery pack which can be mounted on the bottle or BCD. 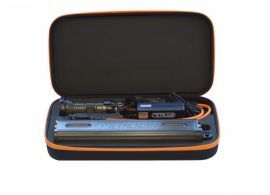 The cablelight is connected on the battery pack with a specially developed connector attached to a long cable. The battery pack connection on the jacket or bottle is an invention on its own and easy to use. 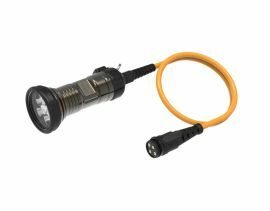 The KL1242 cable light is the most compact model from the Metalsubs cable light collection, with a wide variation in light intensity; from a powerful 2400 lumens to an exceptionally strong 6350 lumens. It’s only 16 cm long and 7 cm in diameter and has a minimal under water weight of 100 grams. Because of its small size, it can easily be placed on a Goodman handle or attached to a helmet, or even hanging on a D-ring when not in use.